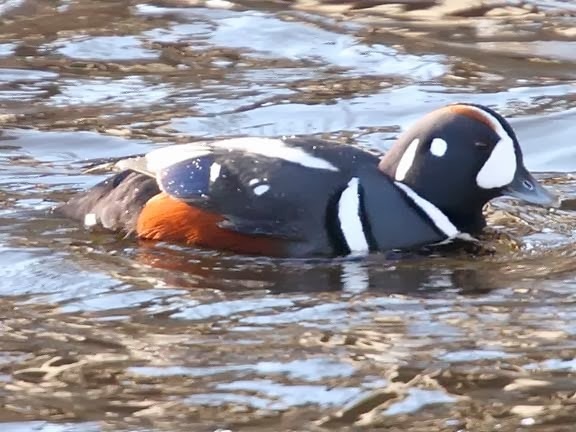 The harlequin duck is a colorful duck that is found in the northern regions of North America, Greenland, Iceland, and Russia. The harlequin is separated geographically into two populations. The eastern population nests in the coastal areas of Iceland, Greenland, and eastern Canada. They winter in the coastal waters as far south as Maine. The western populations nests from the Pacific coast to the Rocky Mountains in Alaska, Canada, and the northwestern United States. 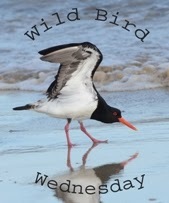 This population winters in the Pacific coastal waters as far south as California. The harlequin nest is built in a well hidden spot on the ground usually near the rapids of a rushing river. They are diving ducks so they find their food, typically fish, water bugs, and other invertebrates, by diving under the water. They prefer to hunt in rapids or other switch moving rivers. The top photo was taken a few years back. We had this male that wintered in the Mississippi for 4 years in a row. The bottom photo was taken in the Yellowstone River in Wyoming. Both pictures are of male birds. The females are much less colorful, as is the case with most ducks. 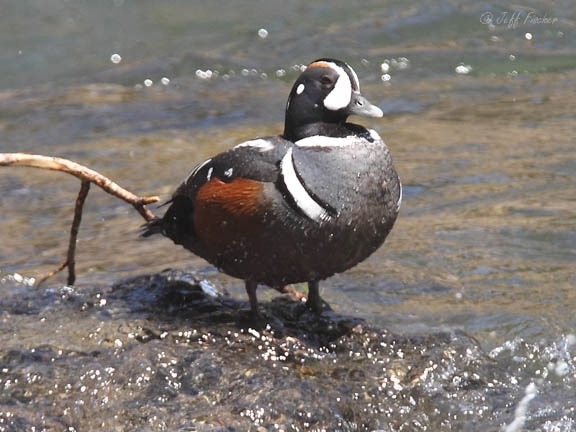 Lovely pics and a great post on Harlequin Duck! Almost looks like a decoy! Very interesting post, its always good to learn something new, nice pics . Such interesting markings. What a pretty bird! As Roger says, it almost doesn't look real. I've never seen one, but I do love the colours. I've always thought these were beautiful, but I've only ever seen them in photos and paintings. I never knew why I thought they were so nice, but then I was going through some old family things and saw my grandmother had had a wooden carving of a harlequin duck. I must associate my warm feelings of her with them. Beautiful markings on the Ducks.